particularly uncomfortable to use. Thanks to the light tunnel the natural light gets into the building enhancing the user’s comfort and enabling electricity saving. The SLT light tunnel conveys the daylight which gets into the light transmitting tube through the dome mounted onto the roof. 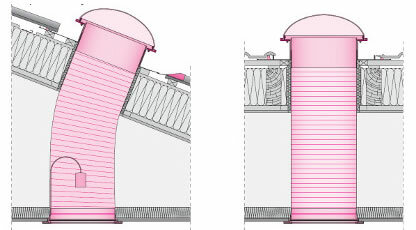 Subsequently, the sun’s rays reflected from the walls of the flexible, reflective tube are directed downwards onto the light diffuser. The diffuser fitted into the ceiling spreads the light, evenly illuminating the whole interior. The light tunnel SLT PLUS version may also be used at night, after installing a light bulb.